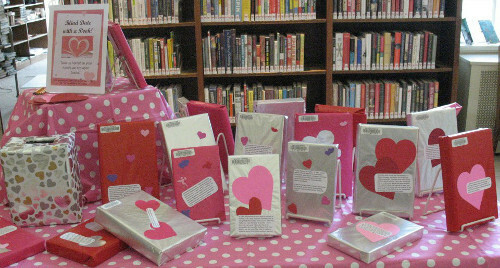 We celebrate "I Love My Library" all throughout February with a variety of activities. Past years we had free DVD rentals, but we no longer charge $1 to borrow a DVD so we don't have that as a special treat anymore. The whole month we have variously themed activities and events, including a benefit concert, movies, "food for fines" (donate canned/dry goods for a food pantry collection and we forgive fines), cake & punch, and other activities. 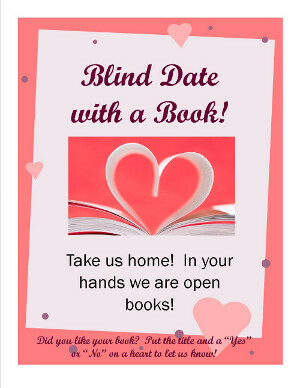 Some how a "Blind Date with a Book" display photo found its way to my Facebook wall, and I loved the idea. Even better, when I brought it up at work everyone else also loved the idea and I was given permission to go ahead and put together a "Blind Date" display. My first step was to get staff input on titles. I specifically did not want new or current best sellers, either of which are likely to be in popular enough demand that our copies would likely be out, on the holds-shelf, or wanted within the time period of the display. I also really wanted this to be a "favorites" display, not just staff picks, but staff picks of books we really love. This endevor may have not gotten quite the high level of response I was hoping for, but I still got a fantastic list of titles from my co-workers to start with, and a second list since compiled by one of them for me to re-fill the display from. I should warn you, I like puns. The sign was actually the last step in this process for me, and the part that required the least amount of time to get together. I've developed a reasonable working relationship with Publisher 2010 and on top of that it just happened to have an appropriately themed event flier template. As it turns out, wrapping and decorating the books took WAY longer than I thought it would. I put little blurbs about each book on the covers, most edits from the actual teaser text on the books, but a few using text from my own reviews. I put up the display on the fourth, and while books aren't flying off the display like I could hope, they are going out. I'll be grabbing a bunch more titles to add to the display on Tuesday (Monday is a holiday anyway). However, while I like how the display looks, I will go far simpler in the decoration!